Our trip was amazing and wonderful and we kept comparing it to our visit to Ljubljana. We both felt that we did not want to leave so soon and if we had a chance to do it over again, we would have arranged more days in your lovely city. Everyone that we encountered was helpful and friendly. YOU being at the top of the list. It was such a pleasure to talk with you and we appreciated the many ways you helped us. We were amazed and delighted to be with people that were so proud and happy with their lives and country. It truly showed with the people we encountered in shops, on the street, and at the pubs we visited, even citizens from other countries. We loved the apartment and its cleanliness and all of the amenities that were provided. It was perfect!!! We would have appreciated a toaster, but we certainly made out alright. We do plan to revisit, not sure when, yet. We will most likely rent the one bedroom as we will both be a bit older and not up to the ladder climb, although we both got a giggle out of it. Than you again, for all of the courtesies you extended to us and making our visit such a wonderful memory. We had a wonderful time in your apartment in Ljubljana. It’s a very nice, clear and clean apartment and the owners are very nice too. I recommend it 100 %. Ljubljana is a very beautiful city. The Apartement is beautiful and clean. The service was perfect and very friendly – we loved to stay in this Studio and had a lovely time in Ljubljana. Thanks so much Eva !! Much love to your team and this beautiful city. We have wonderful memories of our stay in Ljubljana and our time in Slovenia. Slovenia exceeded our expecations. The places we visited in response to your advice worked out really well for us, providing a good coverage of contrasting regions. From Ljubljana we travelled to the beautiful Lake Bohinj district, staying three days at Ribcev Laz. From there we were able to visit Savica waterfalls, Mt. Vogel (by cable car) as well as Lake Bled. Then through the Vrsic pass providing us with the wonderful mountain scenery. The caves at Postojna were the best we have experienced. Next to the area around Novo Mesto where we stayed for three nights at a delightful spa town Dolenjske Toplice, enjoying the scenery and picturesque villages. Croatia next, to visit the Plitvice lakes, followed by about three weeks touring Croatia with the focus on the Adriatic coast. We ended our journey in the best possible way by spending two nights in Piran (Slovenia) where we returned the hire car prior to flying home from Venice. For the period of six and a half weeks we visited some wonderful places and had excellent accommodation – mainly apartments. However, it was your Krakovo Gardens Studio apartment that was the most spectacular, superbly appointed and decorated, with every facility provided and great attention to detail. It was a pleasure to come home to. That, together with your generosity in making us feel so welcome, made our stay in Ljubljana so special. We would go out of our way to recommend your services to others. Ian and I had an absolutely fantastic time in Ljubljana and having such a great apartment certainly had a lot to do with that! The location was incredible — we especially enjoyed strolling into the city at night and seeing all the lights and the river. We loved that the apartment was not only clean and modern, but also unique and arty. It was great staying somewhere that didn’t just feel like another pine apartment or hotel room. The apartment had a lovely, light and airy feel — and how cool is that TV/computer setup?! 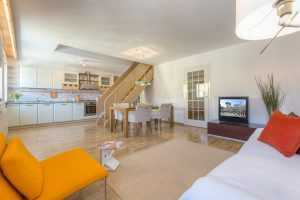 We’d have no hesitation in recommending your Ljubljana apartment to any of our friends. It really was a wonderful couple of nights. Love to you and Alenka. If you’re ever in London please look us up! Thanks again for your hospitality. We loved your Ljubljana apartment and fell in love with the city! 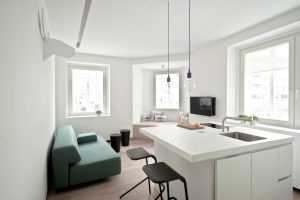 Having recently stayed in the roof-top Ljubljana apartment at Gradaska 8a with my girlfriend and another couple, I would definitely recommend it to others planning a trip to Ljubljana. The apartment itself is very spacious and can easily accommodate 4 people. The open-plan design of the apartment and quality of the fittings and mod-cons give it a very stylish feel but do not detract from its cosiness. The location is perfect, with the terrace looking out onto the castle. The old town can be reached in several minutes by foot. The restaurant just down the road (Skof) serves fantastic local food and the staff is very friendly. All in all, we were really happy with the apartment and would certainly look to stay there again if we go back to Ljubljana. We enjoyed very much our trip around Slovenia and Croatia. The apartment was great. We really liked its design and found it very functional (everything was well organized and well equipped). The apartment has a great location, very close to the center of the town, with a big grocery store just around a corner (which was a big plus for us). The computer with Web access allowed us to prepare the rest of the trip, and in one night we watched one of the DVDs you’ve left for us. (I have installed an additional DVD software on the computer. I hope you don’t mind :-). So thank you very much for everything and we will recommend your apartment to our friends if they go to Ljubljana. Best regards and let me know if you are planning a trip to Lisbon. We really enjoyed our time in your Ljubljana apartment. The close proximity to the city center made for an easy access to all the restaurants, bars, clubs and historic sites of the city. For us, it was perfect for our needs as athletes. We could cook in the kitchen which was sufficiently equipped. The comfort of the apartment was really great. Big beds, air conditioning and Internet made it a pleasure to stay there. We hope to be back next season. The apartment is light and very comfortable, with an elegant and stylist interior. All mod-cons are included, from dish washer, fridge and cooking facilities, to an all action, state-of-the-art multi media system, offering Internet, DVD, satellite television and music. And then there’s the bed. Well I’m a child at heart, so the idea of sleeping on a mezzanine floor appealed to my sense of mischief and adventure. It was going to be a winner, even if we’d found nothing more than a deflated whoopie cushion up there. But we didn’t. We found the most comfortable sleeping quarters that we had the fortune of using during our two weeks stay in Slovenia. I woke up every morning feeling rejuvenated and ready for another power shower before breakfast. And when we were finished we could wander back 100 metres to the riverside for sundowners… or go to one of the many local bars that furnish the local, rather bohemian neighbourhood… or make the short 5 minute walk back into the old Ljubljana city centre. All in all, the apartment made our stay in Ljubljana as good as it was. The owners were more welcoming, friendly and helpful than we could ever have hoped for, yet they still allowed us our peace, quiet and independence — the very reason we chose an apartment over a hotel in the first place. We loved Ljubljana, we loved the apartment and we loved the two of you. We will be back. We had a lovely time there. Everything was fine. The apartment was spotless and well equipped with everything a short (or long!) term visitor would require. It is so well located as well, a lovely walk to the center of the city, and close to convenient shops. I can only say that on my next visit to Ljubljana you will be the first person I write to to see if the place is available. Thanks for your warm hospitality and a perfect apartment. It was a pleasure staying in your lovely apartment. The apartment is located in a very convenient location, central to all the sights that the old town Ljubljana has to offer. Parking was an absolute breeze. We never had problems finding a place to park right in front of the apartment building. We found the apartment itself extremely well setup. It was very clean and it’s interior layout is very clever. The furnishings are refreshing and imaginative with real flair and made an immediate impact as soon as we entered. The area felt very safe. We never felt insecure. On the contrary, we felt very safe and comfortable. Your apartment certainly contributed to a very pleasant stay in Ljubljana which we just loved. Thanks again for everything. Your apartment was the most comfortable place we stayed on our entire trip, and it was such a great place to explore Ljubljana from. We were so pleased – it looked just like in the pictures, and the autumn leaves outside the windows were beautiful. We are going to recommend your apartment to all our friends. We hope to come back and stay there again someday. I have never stayed in a nicer and more comfortable holiday apartment. The apartment is top of the class! Every detail… furniture, equippment, mod-cons, location… it almost couldn’t be better. But best of all was the bed on the mezzanine. We really enjoyed spending a couple of days in your apartment in the center of the city, only a few steps away from the old town Ljubljana. I can’t really fault anything. The only issues we had is that we couldn’t play our DVDs on PC as version of Windows is Vista basic and needs encoder to be downloaded. We didn’t know where bin was outside and non in the bathroom. That’s it, really. It didn’t affect our stay and we had a very relaxing time as we were left to our own devices. The shuttle bus was waiting for us on Saturday and got us to airport in good time, too. I will recommend people to stay there and will pass on your e-mail if that’s OK. I don’t like giving any faults, but ones above are minor and apart from that was perfect apartment and service. 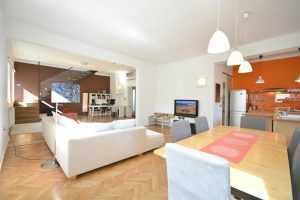 Check out this fine FLA apartment: Ljubljana Apartments Testimonials – Apartments for Rent in Ljubljana.